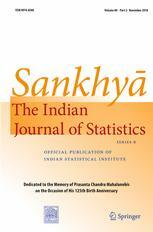 Sankhya, the Indian Journal of Statistics is the official publication of the Indian Statistical Institute. This quarterly journal publishes research articles in the broad areas of Theoretical Statistics, Applied Statistics, Mathematical Statistics and Probability. Each year the Journal is published in two Series. Series A, published in February and August, primarily covers Mathematical Statistics and Probability. Series B, published in May and November, primarily covers Applied and Interdisciplinary Statistics. In case of overlapping topics, the applied and theoretical flavors of the paper are considered to determine the appropriate series.